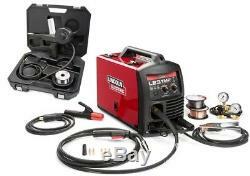 Lincoln K3461-1S LE31MP Multiprocess Wirefeeder Welder with Spool Gun. Processes: MIG, Flux-Cored, Stick, DC TIG, Aluminum with a Spool Gun. Input Power: 120/1/60 Input Current at Rated Output 20 A. Output Range: 30 - 140 A MIG 25 - 90 A Stick 10 - 120 A TIG 40-500 WFS (1.3-12.7 m/min). Weight/Dimensions (H x W x D): 34.5 lbs. (15.6 kg) 13.6 x 8.9 x 18.1 in. (345 x 224 x 460 mm). Lincoln K3461-1S LE31MP Multiprocess Wirefeeder Welder This Lincoln Electric LE31MP. Lightweight and portable welder connects to 120 volt power and is an excellent choice for MIG, STICK, Spool Gun, Flux-Cored, or TIG welding. The intuitive user interface, easy setup, and full list of accessories permits welding in no-time. MIG Wide 30-140 amp welding output for MIG, FCAW and Spool Gun allows for welding on 24 to 5/16 material. Durable cast aluminum gear box delivers added torque and quiet operation, and brass-to-brass gun connection enhances conductivity. Smooth arc starts and a forgiving arc makes dialing in your application easy. Weld with or without a foot pedal, the machine will automatically detect and configure when a foot pedal is connected. Easy arc starts and optional patent pending TIG torch assembly eliminate the need for a manually controlled gas valve. STICK Smooth arc starts prevent sticking. Heavy duty electrode holder and cable included. K4360-1 Magnum PRO 100SG Spool Gun. Magnum PRO 100L gun and 10 ft. (3.0 m) cable assembly with brass connection and 8-pin trigger connector (K530-7). (0.6 mm) tapered contact tips (Qty 3) (KH831). (0.9 mm) tapered contact tips Qty. Gasless nozzle for Innershield welding (KH836). Gas nozzle for MIG welding (KH835). Spindle adapter for 8 in. (203 mm) diameter spools (KH720). (0.6 - 0.9 mm) wire diameter dual track drive roll for MIG and flux-cored welding (KP2948-1) Shielding Gas Apparatus. Harris 3000290 Gas Regulator (S25805) and 52 in. (1.3 m) hose (S19303) for use with Ar/CO2 blend gases. For use with CO2 shielding gas, order a Lincoln Electric S19298 CO2 shielding gas bottle adapter. (0.6 mm) diameter SuperArc L-56 premium MIG wire. (0.9 mm) diameter Innershield NR-211-MP flux-cored wire Other. Work clamp and 10 ft. Electrode holder with 10 ft. Cable for stick welding HEAVY DUTY WIRE DRIVE ENHANCED QUALITY AND EASY TO USE Enhanced Quality 1. Brass-to-brass gun connection enhances conductivity. Rigid drive aids wire alignment. The cast aluminum body with an enclosed multi-stage gear box delivers improved torque and quiet operation. Easy-turn drive tension adjustment with numeric tension indicators. Fast tool-less drive roll changeovers. The dual track drive roll ensures positive flux-cored wire feeding with common wire diameters. Spool gun ready switch allows user to select spool gun or standard push gun drive operation. Oversized twist connectors for durability. PERFORMANCE PLUS The K3461-1S bundle includes. K4360-1 Magnum PRO 100SG Spool Gun Designed to easily feed 4 in. (102 mm) diameter 1 lb. (0.45 kg) spools of. (0.9 mm) diameter SuperGlaze aluminum MIG wire. (0.9 mm) contact tips qty. 3, gas nozzle, and a 1 lb. (0.45 kg) spool of SuperGlaze 4043. (0.9 mm) MIG wire. Packaged in a convenient carrying case. Ready to weld PTA-9 TIG Torch Light and easy to use, these torches give you the power of maximum versatility and maneuverability. A molded, knurled handle gives you a sure grip so you can focus on the weld. Whether you are an occasional TIG welder, fabrication shop or production welder, Pro-Torch TIG torches are right for you. Foot Pedal This TIG foot pedal controls the amperage when TIG welding with LE31MP. Depress pedal to increase current. Depressing pedal fully achieves maximum set current. Fully raising the pedal finishes the weld and starts the After flow cycle. This foot pedal will give the optimum amperage needed for any TIG welding project. Welding Cart Full-featured cart is designed to store and transport a welder, 80 cubic foot gas cylinder, welding cables and accessories. Includes an angled top shelf for easy access to welder controls, a lower tray for added storage space, a sturdy handle also used as a convenient cable wrap hanger. The item "Lincoln K3461-1S LE31MP Multiprocess Wirefeeder Welder with Spool Gun" is in sale since Saturday, October 13, 2018. This item is in the category "Business & Industrial\CNC, Metalworking & Manufacturing\Welding & Soldering Equipment\Welding\Welders, Cutters & Torches\TIG Welders". The seller is "jsn2000" and is located in West Union, Iowa.